The Cura II and Cura II Supreme Community Beds are fantastic profiling bed solutions for most patients, but some users may require some extra assistance with getting in and out of bed. The Cura II Community Bed Grab Rail is an easy-to-apply grab rail compatible with both the Cura II Profiling Community Bed and the Cura II Supreme Profiling Community Bed. 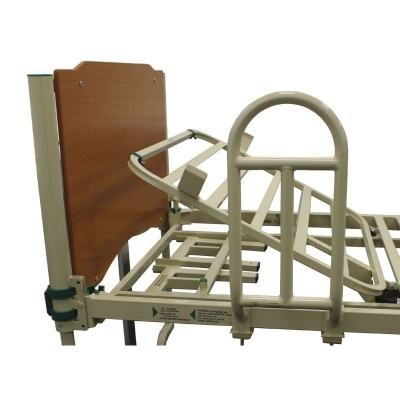 Using two easy-grip knobs, it can be applied anywhere along the side of the bed, providing extra support for patients getting in and out of their bed. The grab rail provides additional support for patients entering or exiting their bed. It's ideal for those with some mobility who require a little additional support when getting up or sitting back down, helping them to maintain their independence. Using two easy-grip handles, the grab rail can be applied anywhere along the side of the bed quickly and efficiently. This enables each patient to get a custom setup that best suits their needs and preferences. Please note: This listing is for the grab rail only, and does not include a bed. Additionally, this item cannot be used alongside the Cura II Community Bed Side Rails.